Update: Check out our video of this Feast of the Seven Fishes. Another year, another crazy multi-course Feast of the Seven Fishes dinner for two on Christmas Eve. Since we've been eating so much great local fish and seafood this year, we decided to keep with that theme and source everything as locally as we could. The produce came from our garden, the oysters were from Carlsbad Aqua Farm, and the rest is local fish (primarily Baja caught) from Catalina Offshore Products. We picked clementines from the communal tree at our garden, and used the juice (along with some lime) to make a simple Halibut ceviche. Some finely chopped onion and fresh chiles (used to marinate, but not served) accentuated the delicate flavor of the fish. 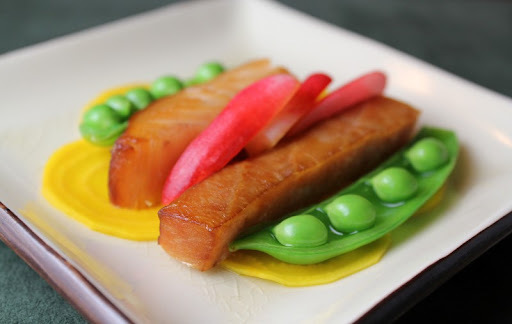 Each year there seems to be one dish where we spend way too much time messing with silly plating. Last year it was our Niçoise Tuna Skewers. 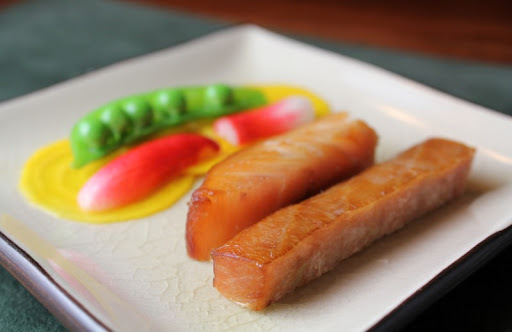 This year it was this smoked fish dish. The fish is Opah (in front) and local Sea Bass (in back). Both fish were nice, but the Opah was particularly good. We kept the oysters simple this year. 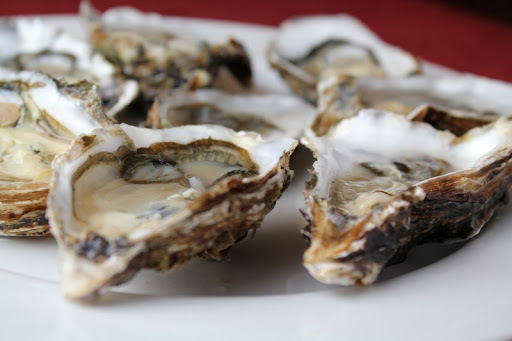 Pacific Oysters from Carlsbad Aqua Farm that we slurped down with a little bit of classic mignonette. I can't fathom why we've never done a mojo de ajo dish before. We'll certainly be doing it again, as this may have been my favorite dish of the meal. 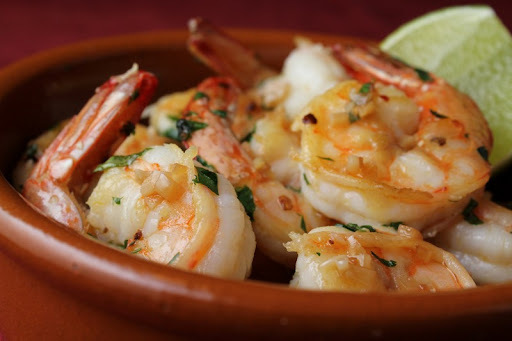 The Mexican White Shrimp from Catalina Offshore are so good that you don't need to do much to them. Soft, sweet garlic from the mojo, some cilantro and a squeeze of lime. Perfect. 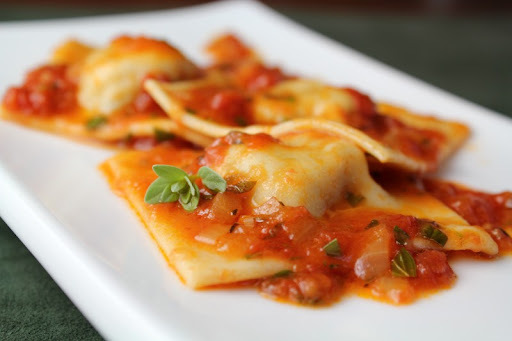 Simply prepared with a little bit of vermouth-tinged pan sauce. The Sculpin was good, but the beets were even better. We love golden beets - all of that rich beet flavor without the crimson mess of a red beet. So there you have it - this year's seven-fish feast. Six dishes, seven fishes, two very content diners. 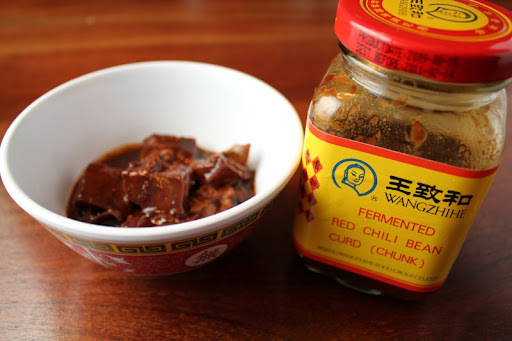 Around this time last year, I came across a post on eGullet describing what seemed a very intriguing snack - roasted peanuts with a sauce made from fermented red bean curd. I gave it a try and liked it so much that it instantly became a new holiday tradition. 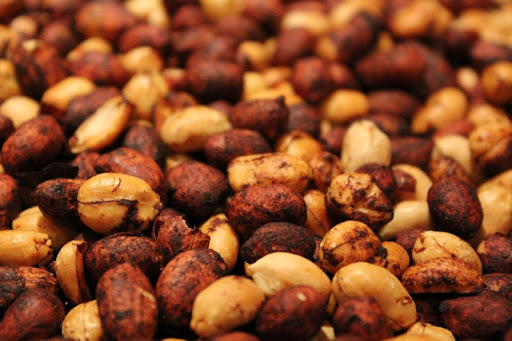 These peanuts are completely addictive and are great to have around to nibble on during the holidays. They also make for a nice little gift. I made this year's batch a few days ago, and thought I would share the recipe with all of you. Pictured above is the bean curd I found at my local Asian supermarket. While it mentions "chili", it really isn't hot at all. The bean curd is in soft chunks - roughly an inch square. The smell and taste is pretty funky, but don't let that put you off - it adds a fantastically interesting flavor to the nuts. 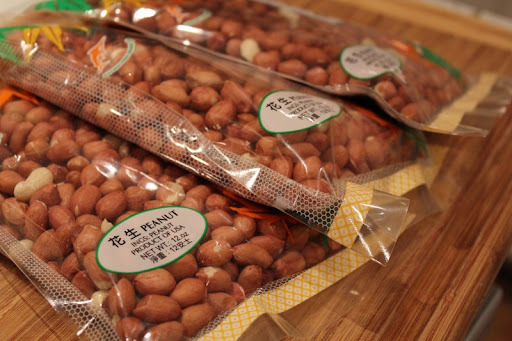 The peanuts I use also come from the Asian supermarket. They are skin-on and in 12oz packages. The are just ordinary peanuts, though, so I imagine any brand would do just fine. 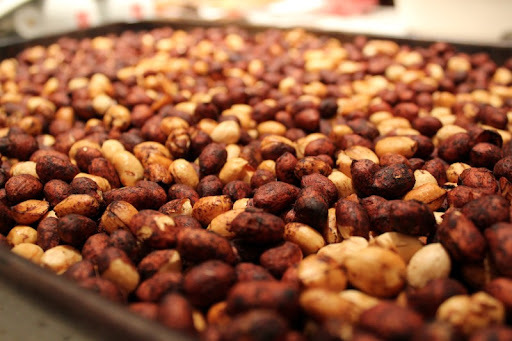 The nuts get stir-fried until they start to color. I do this one package of nuts at a time to keep things manageable. Then I drizzle in some of the bean curd mixture, stirring it through to coat the nuts. An easy snack with an unusual and addictive flavor. 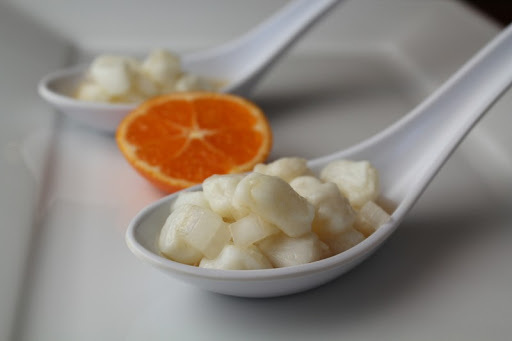 In a small bowl, mix the bean curd, water, salt and sugar together until completely smooth. If it seems too thick, add some more water. 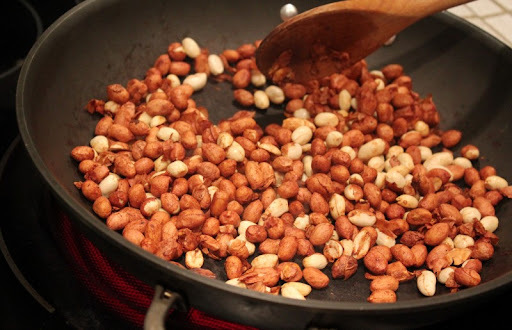 In a wok or skillet, stir-fry one of the packages of peanuts over medium to high heat. You may want to turn on your overhead oven fan if you have one. 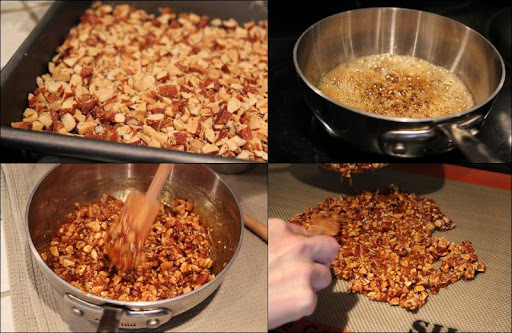 Once the nuts are starting to color, add three tablespoons of the bean curd mixture one tablespoon at a time, mixing it through. After a few more minutes, pour the peanuts into a large sheet pan (preferably one with high enough sides to keep things from spilling over). Repeat the process with the remaining two packages of peanuts. Spread the peanuts evenly on the sheet pan and put them in the oven. After about 10 minutes, remove them and stir them around to redistribute. If you have bean curd mixture left over, add some more and stir it through. Put the peanuts back in the oven and repeat this process two or three more times. If some of the peanuts char a bit, that is fine - but you don't want them to burn too much. Let the peanuts cool. When they are warm, they will not seem like they are going to be crunchy, but don't worry - they will be fine after resting. 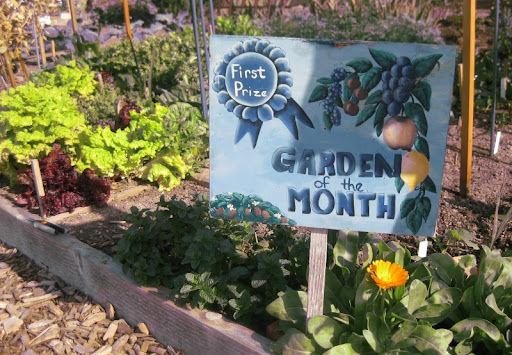 Sherry's garden plot was awarded "Garden of the Month" this past month at the Pacific Beach Community Garden. Not bad for something that was just a plot of dirt with potential a few months ago. 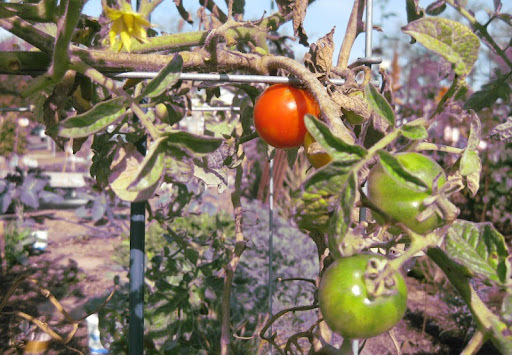 While I'm bragging, I might as well mention that we're still getting tomatoes in December. I love you, San Diego! The issue of what to do with leftover home-smoked almonds doesn't come up often in our household - they are usually gone too fast. Recently, however, we smoked a big enough batch that they somehow managed to outlast the initial wave of gluttony. 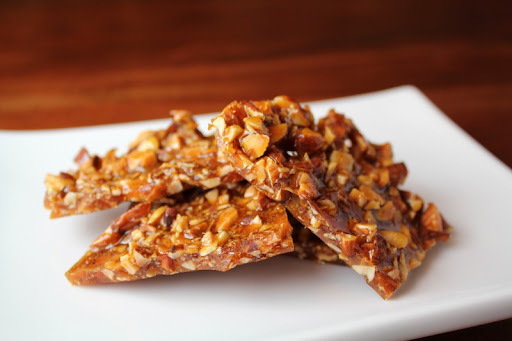 Faced with these rarefied leftover almonds, we decided to try making them into a brittle. Neither one of us really has much of a sweet tooth, but if you add nuts to the equation we're all over it. 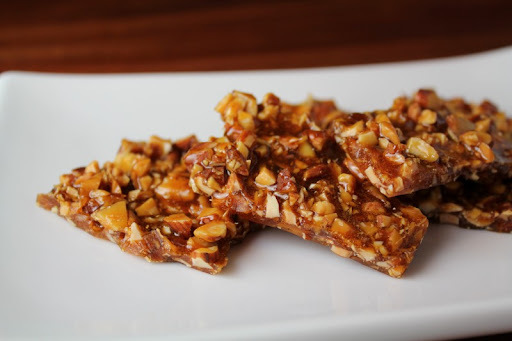 We found an almond brittle recipe in Mario Batali's Holiday Food and went from there. The recipe is pretty simple. Coarsely chop some smoked almonds, then toast them in the oven a few minutes to make sure they're nice and crunchy. Put plain, white sugar into a sauce pan along with a little water to moisten it and set over medium heat. Watch carefully - it will be clear and bubble vigorously as the water cooks off, but once it starts turning from straw to caramel colored you will need to move fast. Just before it hits the color you want, pull the pan from the heat and quickly stir in the nuts. Immediately spread the mixture out on a sheet pan lightly greased with butter or lined with a Silpat . Once it's cool, the candy can easily be snapped into small, irregular pieces. 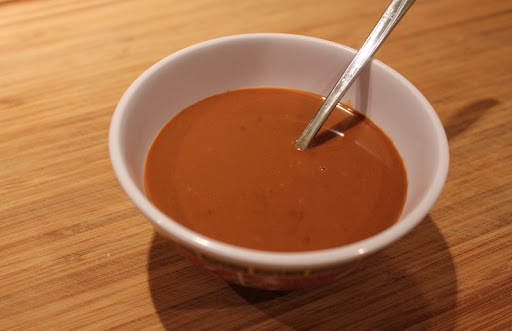 You can adjust the flavor by varying the darkness of the caramel - cooked to just tan, it'll be rather toffee flavored, but cooked to a deep caramel color it will be more intense with a slight bitterness to it. Since the smoked almonds are already intense, we found that we prefer it on the lighter side of caramel. 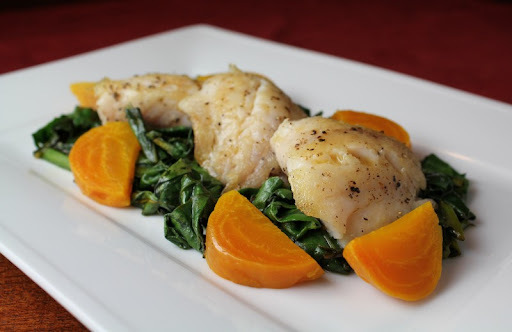 This recipe can easily be doubled or even quadrupled. 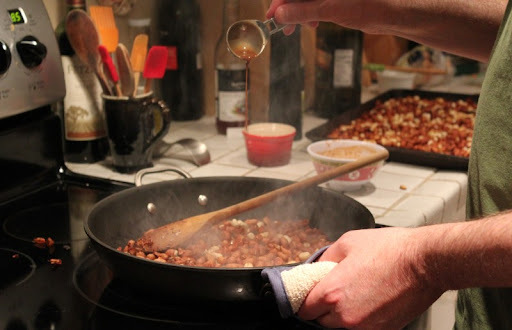 Coarsely chop the smoked almonds and spread them out on a sheet pan. Toast them in a 400°F oven for about 5 minutes, then set aside to cool. Lightly grease another sheet pan with butter, or line it with a Silpat baking mat. Put the sugar into a small, heavy-bottom sauce pan. Stir in 2 tablespoons of water and set over medium heat. Without stirring, let the sugar come to a boil and watch carefully until it starts turning a golden, caramel color (about 15 minutes). Just before it hits the color you want, pull the pan from the heat and quickly stir in the nuts. Immediately dump the mixture onto the prepared sheet pan and use a silcone spatula to spread it out into an even layer about a quarter-inch thick. Let the candy cool completely and then break it into attractive, irregular pieces. Stored in an airtight container, the brittle will keep for several weeks.